100% legal, maintain the Verykool's warranty. 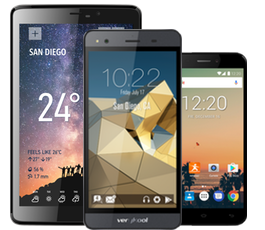 Unlock your Verykool phone with top unlocking company. Permanent unlocking service and valid for all models. For the lowest price and in the fastest time. How to unlock my Verykool phone with doctorSIM? Unlocking your Verykool cell phone with doctorSIM is child's play. No technical knowledge is required. Request your unlock code online, receive your code and easy-to-follow instructions by e-mail, and then type the code into your phone to finalize the process. It couldn't be easier! What are the advantages of unlocking my Verykool phone with doctorSIM? Convenience and full guarantees! Our method of unlocking via IMEI is the method recommended by Verykool, other phone manufacturers and the network carriers themselves. With doctorSIM, you will save time, money, and effort, because the entire process is carried out online meaning you don't have to send your phone anywhere. How much does it cost to unlock a Verykool phone? Unlocking your Verykool device with doctorSIM can be very economical, as you can see by selecting the country and the carrier to which the phone is locked. How can I unlock my Verykool phone? When you insert a SIM card from a network provider different to the one your cell phone is locked to, you will be prompted for the unlock code sent to you by doctorSIM. Follow the instructions received carefully to insert the code and complete the unlocking process. Does my Verykool phone have unlimited unlocking attempts? Yes, Verykool devices have unlimited unlocking attempts which means you don't have to worry about being unable to unlock the phone if you make a mistake typing in the unlock code. Can this unlocking method damage a Verykool cell phone? At doctorSIM, we 100% guarantee our service will not adversely affect your device in any way. Avoid taking the risk of damaging your phone using free services or trusting websites that do not offer full guarantees. What happens if my Verykool phone relocks in the future? The unlocking is permanent. You will never have to request another unlock code for your Verykool ever again. Once unlocked, your Verykool phone will be unlocked forever! Can I update the software of a Verykool on a regular basis? You have nothing to worry about! Continue downloading the official Verykool software updates as normal. The unlocking provided by doctorSIM will not be affected by these updates. Our unlock codes are permanent. Reliable and PCI DSS compliant. Quality controls and certificates for your online security. IMEI-based unlocking services keep the cell phone's warranty. First-class customer support available by telephone, chat, and e-mail. The fastest delivery times on the Internet.